Europe is home to some of the most lucrative markets for apparel and clothing worldwide. Among the leading European countries, Germany’s clothing industry has the highest value, amounting to approximately 63.3 billion U.S. dollars in 2017. While Western Europe performs better overall, in Eastern Europe this sector has seen a 27.8 percent increase in market value since 2013, accounting for approximately 80.8 billion euros in 2018. Women’s and girl’s apparel is responsible for the largest share of revenue overall, making up around 38 percent of the market in 2017. In recent years, there has been changes in the dynamics of the clothing manufacturing industry in Europe, with many companies choosing to outsource production to cheaper locations across the world. As a result, countries, such as China, Bangladesh, Turkey, India and Cambodia, now rank as the leading suppliers of clothing imported into the European Union. In 2017, imports from China alone were worth approximately 27.2 billion euros, representing a share of around 20 percent. That said, clothing manufacturing still has a place within Europe. The industry has shown to have a stable development over the last five years, reaching an estimated turnover of 181 billion euros in 2017. Although annual turnover rates have been on the rise, employment in the sector has declined considerably over the last years, dropping from around two million employees in 2009 to an estimated 1.7 million employees in 2017. Many of Europe’s most popular fashion brands are among the leading clothing companies worldwide in terms of brand value. Based on sales in Europe alone, Inditex of Spain comes out on top, with a turnover of around 16 billion euros in 2017, followed by H&M of Sweden and Marks & Spencer, which is based in the UK. Inditex is responsible for several well-known clothing brands, including Zara, Bershka, Massimo Dutti and Pull & Bear. 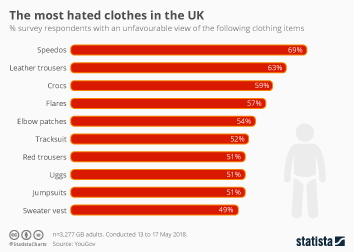 The online market for clothing is also going from strength to strength in Europe, enabling companies such as Zalando and ASOS to reach revenues as high as 4.5 billion euros and 1.9 billion British pounds, respectively, in the 2017 financial year.